Pic of Abby and Creighton taken July 2011. 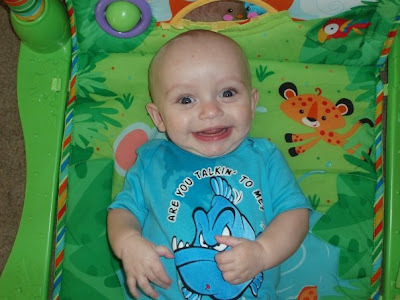 This pic of Creighton was taken late November 2008, almost 7 months old! Mellow, curious, happy, sleeping through the night, a night owl, playing with cars, crawling away to hide down the hallway and giggling hysterically when you chase him! In love with his parents... and me... and Uncle Brian... and Uncle Tom... and Aunt Amy... and his grandparents... and well, everyone. He was cuddly, independent, loved his doggie Oskar and was a sloppy, albeight adorable eater of 99% of what you put in front of him! And let's not forget that he's a clean freak -- hating food on his hands, sand in his toes, and pretty much any speck of anything on him. On the development curve, he was always ahead (which is an amazing feat for a preemie!) -- tall and skinny. Pic of Abby taken approx. July 2011. Cute babies!! Photo taken March 22, 2013 at Disney's California Adventure! I love my nephew and niece.... can you tell? !